The Anglican cemetery in Malaga is to be added to the Catálogo General del Patrimonio Histórico Andaluz, in English the general catalog of historic places, after the Andalucian Directorate General of Cultural Assets approved it’s inclusion as a Bien de Interés Cultural (BIC), location of cultural interest. St Georges cemetery is located on around 8,000 sqm of land close to Malaga’s Plaza de Toros on the eastern side of the port, and was originally founded by the British Consul to Malaga William Mark in 1830 in response to protestant burials on the seashore in the dead of night, a practice he found disgusting and lacking in dignity. 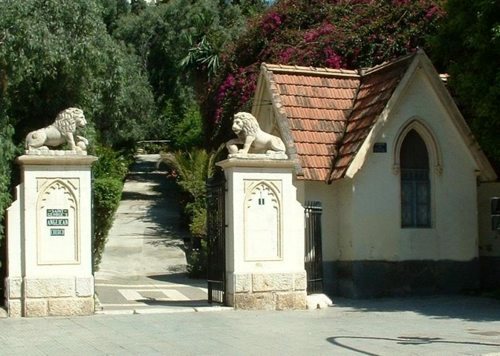 Within the grounds of the cemetery there is also an Anglican chapel built in 1839, and expanded in 1891 to become the existing church servicing Malaga’s Anglican communion. The gardens of the cemetery double as a botanic garden with several rare specimens of tree and shrub thriving. Inclusion as a BIC on the general catalog is aimed at ensuring protection of the graves, structures, decorative walls, and of the gardens. As mainland Spain’s first protestant cemetery, it has been described in the general catalog as a monument of “outstanding historic and architectural significance”. It is expected the cemetery will be formally included in the general catalog within the next 12-24 months, although the procedure for registration requires the church board begin the process of protecting the premises immediately after being notified of the decision to start registration. Flying to Malaga, Seville, Madrid? Train or bus to Ronda? Book online with OMIO and help Ronda Today! Excellent accommodation choices in and around Ronda. With the best deals at Booking.com! By booking a hotel or other accommodation via the reservation box above you are helping Ronda Today to be as as acurate and up to date as possible with the most comprehensive information on the web about the town of Ronda in English. The essential Ronda Today Printable guide at 5 euros is well worth the small investment and helps you get the very best out of a visit to this wonderfull Andalucian town. Thank you for your support and remember that at booking.com, very often the hotel deals are even cheaper than going directly to the hotel! Welcome to one of Spain's most visited cities (and for good reason.) Our little city is very compact and in fact from arriving in Ronda, to seeing the Real Maestranza bullring, the Puente Nuevo and El Tajo gorge, the many beautiful churches, our museums, or the wonderful coffee shops and tapas bars, we have it all within a short 30 minute walk. A walking tour of Ronda is a pleasant and enjoyable way to spend a lazy few hours, almost everything you could want to see in Ronda is no more than 200-300 metres from the new bridge. But to really get the most out of Ronda, book a hotel, stay with us for a few days and immerse yourself into the City of Dreams. Grazalema Cycling – Guided tours, Self Guided and Bike Hire. 20 Great Pictures from Ronda, Spain | Baby and Life! Find and book the best Ronda hotel deals available with last minute booking. 10 words that Spanish people ALWAYS say! Don’t miss the fifth edition of the best Gastronomic Event! Caminito del Rey closed due to bad weather? Tickets for combining Train, Bus and Caminito del Rey entry on sale from 1st February 2019. 120,000 tickets available for the Caminito del Rey. Ronda Today 21 Page A4 Printable Guide and City Map – Just 5 Euros! Buy it Now! "We found our way straight to a car park, with the help of your guide, and walked to the bridge. Ronda is so beautiful. Unfortunately, we did not have too much time to explore but managed to see a great deal because we had read the guide in detail and worked out the best use of the limited time we did have. All in all, the guide proved to be a good investment!" Thank you for visiting our website. Below is a selection of products from Amazon UK that may be of interest to you. Thank you for your support!